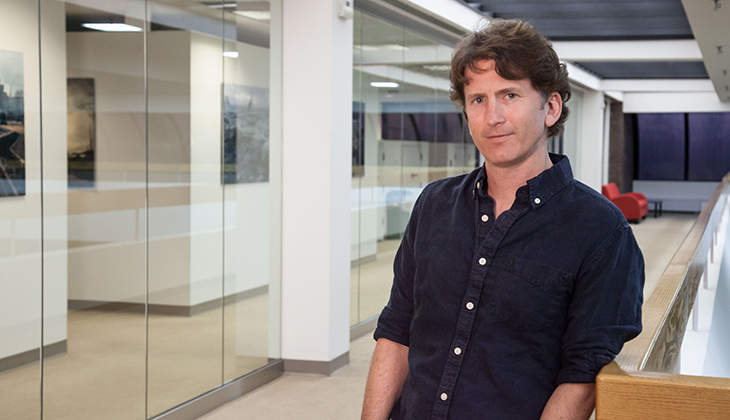 Todd Howard, Executive Producer and Game Director at Bethesda Game Studios, will soon become the Academy of Interactive Arts & Sciences 22nd Hall of Fame recipient. Howard has created some of the industry’s most successful games by pioneering open-world gameplay. He has been integral in the creative direction and growth of such well-loved franchises as The Elder Scrolls and Fallout, which have been recipients of numerous D.I.C.E. Awards throughout the years. Both The Elder Scrolls and Fallout are known for their experiential approach to world-building and storytelling. The scale of their open worlds, variety of questlines, and near-endless cast of characters has ensured no two players have the same experience. Howard began his videogame career at Bethesda Softworks in 1994. His first game development credit for Bethesda was in 1995 with The Terminator: Future Shock. His first foray into the Elder Scrolls series was as a designer for The Elder Scrolls: Chapter II – Daggerfall (1996), and then as project leader and designer of The Elder Scrolls Adventures: Redguard (1998). Howard first began pushing world creation and player modding in 2002’s breakthrough hit The Elder Scrolls III: Morrowind as the project leader and designer. Following Morrowind, Howard continued to work on several critically acclaimed sequels for The Elder Scrolls series, including The Elder Scrolls IV: Oblivion (2006), receiving many Game of the Year awards. He recently served as Game Director of The Elder Scrolls V: Skyrim, one of the most critically acclaimed and best-selling games of all time. Released in 2011, Skyrim won over 250 Game of the Year awards. It mesmerized critics and gamers alike with its masterful weaving of combat, crafting, skill and exploration systems. Over its lifetime, The Elder Scrolls franchise continually surpassed technical and creative expectations and set the standard for open-world role-playing games. The Fallout series was similarly a rare combination of critical and commercial success. Howard served as game director and executive producer of Fallout 3 (2008) as well as his latest game, Fallout 4, which was released in 2015. Howard employed player-driven narrative to create a game that’s both massive and personally affecting. Fallout 4 received Game of the Year at the 2016 D.I.C.E. Awards. Howard also directed Fallout Shelter, the studio’s first mobile game, which quickly became the #1 App for both Apple and Google, and also won Mobile Game of the Year. Among the many numerous career accolades already presented to Howard, he is the 16th recipient of the Game Developers Conference Lifetime Achievement Award. GamePro magazine named him to the Top 20 Most Influential People in Gaming over the Last 20 Years. He received the D.I.C.E. Award for Best Game Director in 2012 and 2016. In 2014 he received the Lara of Honor, Germany’s lifetime achievement award for gaming. The AIAS Hall of Fame honor is bestowed on game creators who have been instrumental in the development of highly influential games and moving a particular genre forward. These individuals demonstrate the highest level of creativity and innovation, resulting in significant product influence on a scale that expands the scope of the industry. Past AIAS Hall of Fame recipients include: Hideo Kojima (2016), Leslie Benzies (2014), Dan and Sam Houser (2014), Tim Sweeney (2012), Dr. Greg Zeschuk (2011), and Dr. Ray Muzyka (2011). Additional Hall of Fame honorees can be found at: http://www.interactive.org/special_awards/index.asp. Tickets to the 2017 D.I.C.E. Summit and 20th Annual D.I.C.E. Awards can be purchased at www.dicesummit.org.